April: April is the main French advocacy association devoted to promote and protect Free/Libre Software. It is a major player in spreading the word of free software and open standards to the general public, professionals and institutions in France. It also acts as a watchdog on digital freedoms, warning the public about the dangers of private interests keeping an exclusive stranglehold on information and knowledge. 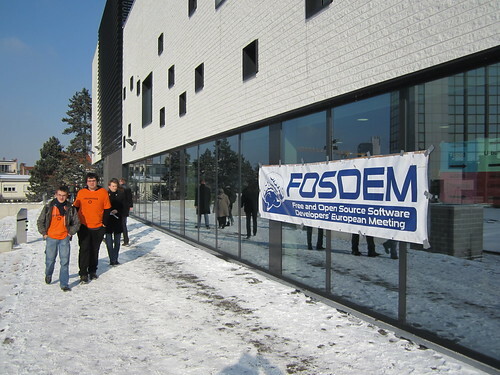 FOSDEM: The Belgium-based FOSDEM team organizes the free and non-commercial Free and Open source Software Developers' European Meeting (FOSDEM) event to promote the widespread use of Free and Open Source software and provide FOSS projects with a platform to meet, exchange, and collaborate. Framasoft: Framasoft is one of the most prominent voices of FLOSS (Free, Libre, Open Source Software) in France and other French-speaking countries. The organization’s aim is to educate users about the importance of open software. Free Software Foundation Europe: Free Software Foundation Europe works across Europe for freedom in the information society by promoting Free Software and Open Standards in politics, business, law, education, and society at large. Nowoczesna Polska: the Modern Poland Foundation consequently cares for modern education and development of information society in Poland. Participatory Culture Foundation: The US-based organization is dedicated to creating open and decentralized video tools and services. The grant is earmarked for Universal Subtitles, a project of Participatory Culture Foundation that makes web video accessible through a collaborative platform for captioning and translation of video. Mozilla has collaborated on this open-source project since its creation. On 6 prizes granted, 5 are granted to european organizations and one is granted to an US-based organization. Is free software more active in Europe ? Gage: This round of grants is indeed focused on Europe. Event the PCF grant is to enable them to do more things in Europe. So yes, this is 100% Europe-centric. This does not mean that we do not care about similar organizations in other parts of the world, it's just that this time we wanted to focus on Europe. @Hellix (comment #3): the organizations are international 5 ( in Europe, 1 in the states), but the grants are focused on Europe, since the PCF money is to enable their Universal Subtitles program to focus on Europe. That Mozilla Grants page is indeed very outdated, giving no indication that any grants were made in 2011, and no clue how to apply for grants. What was the application and review process for the grants that were just made? Will these grants be announced anywhere besides at FOSDEM and on this blog? More transparency, please. Janet : your request is legitimate! The Grants page is being updated as we talk. I'm working with the folks from the Mozilla Foundation on this very topic. Hi, great article, but what was the application and review process for the grants that were just made?